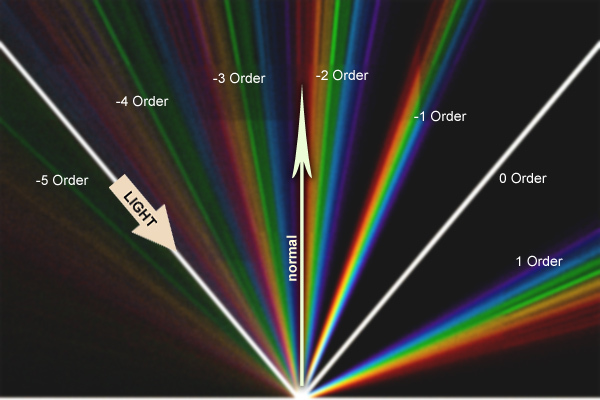 This post introduces the mathematics behind the optical phenomenon known as diffraction grating, which is responsible for iridescent reflections in many materials. 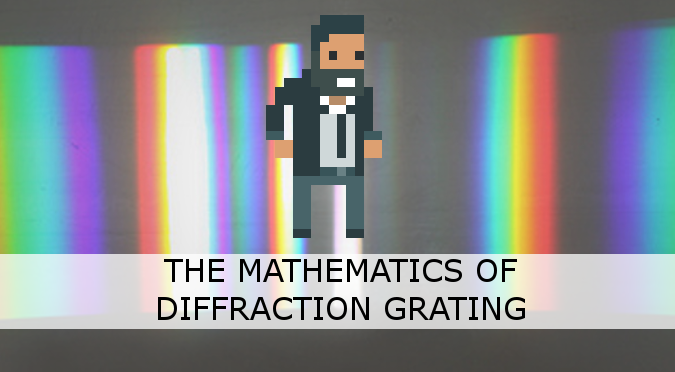 The previous post in this series, Understanding Diffraction Grating, explained why iridescence occurs on some materials. Light is a wave, and it bends every time it finds an obstacle in its path. If a material presents a microscopic slit or a bump, this will an incoming planar wave to scatter in all direction. If those slits or bumps are arranged in a regular pattern, a new wavefront is generated for each one of them. All those wavefronts will interfere with each other, causing certain wavelengths (which are perceived by the human eye as colours) to appear prominently. We now have everything we need to start modelling this phenomenon mathematically. Let’s start by imagining a material which features imperfections that repeat at a known distance . 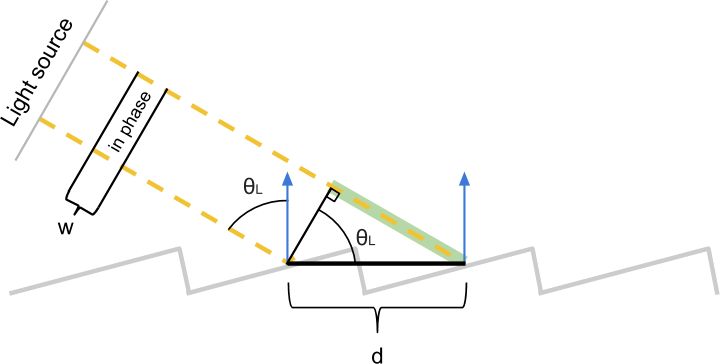 For the purpose of this derivation, the angle between the incident light rays and the surface normal is in. Let’s also imagine that the viewer is oriented in such a way that they receive all the reflected rays with angle . Each imperfection scatters light in all directions, so there will always be rays of light aligned with the viewer, regardless of . Since the imperfections repeat regularly every nanometres, the scattering pattern itself repeats every nanometres. This means that there will be at least a light ray reaching the viewer for each slit. 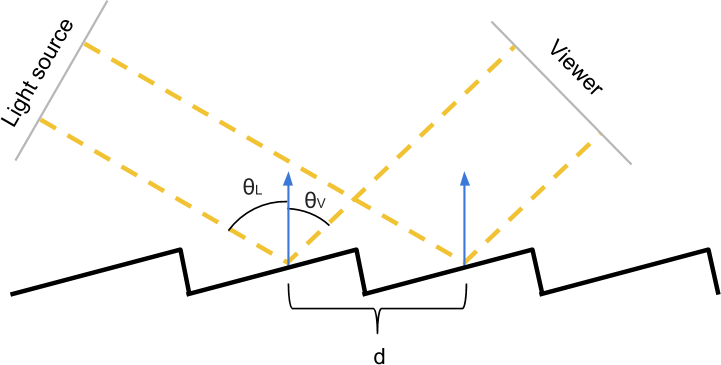 The two rays of light depicted in the diagram above travel different distances before reaching the viewer. If they start in phase, they might not be when they arrive at their destination. To understand how those two rays interfere with each other (constructively or destructively) we have to calculate how off phase they are when they reach the viewer. Those two rays are guaranteed to be in phase until the first one hit the surface. The second ray travels an extra a distance (in green) before hitting the surface as well. Using some simple trigonometry, it can be seen that the length of the green segment is . Using a similar construction, we can calculate the extra distance that the first ray travels towards the viewer before the second hit. In this case, we can see that . 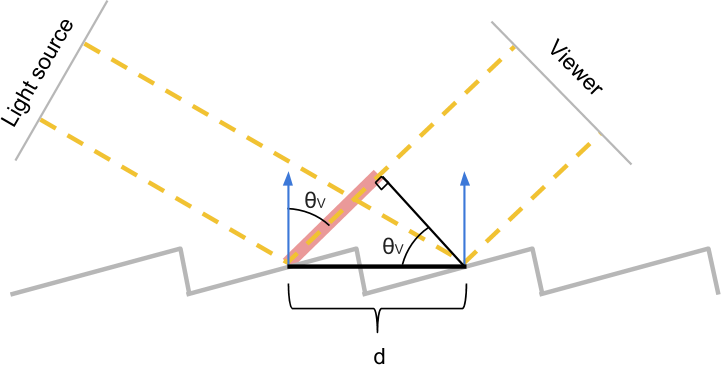 Those two segments are critical to determining whether the two rays are still in phase or not when they are finally detected. 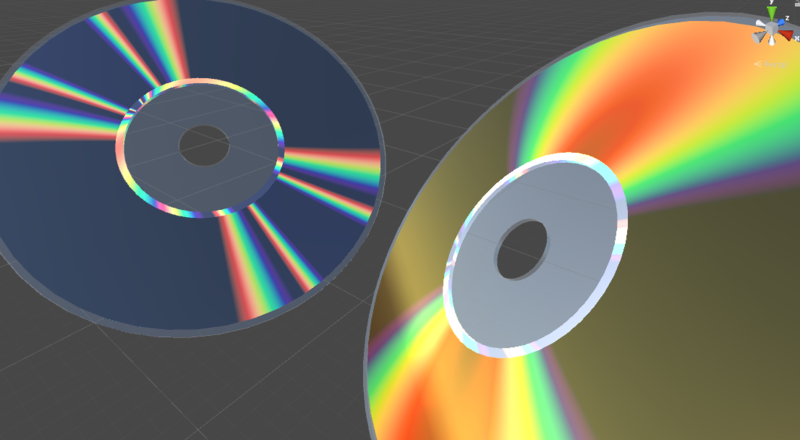 Their difference measures the difference in length of those two rays. If it is zero, we know for sure that the two rays are in phase, since they have effectively travelled the same distance. Let’s take a moment to understand what that equation means. If the light comes with incident angle , what will a viewer looking at the material with angle see? All the incoming wavelengths which are integer multiples of will interfere constructively, and appear strongly in the final reflection. Hence, those are the colours that will be seen by the viewer.